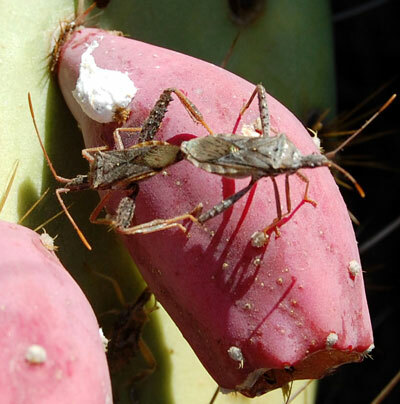 This pair of Narnia bugs is mating over lunch, a fruit of Prickly Pear (Opuntia engelmannii) at Mesquite Wash, Mazatzal Mountains, Arizona. 24 Aug. 2008. Most leaf-footed bugs have an effective defense in the form of a noxious chemical spray, thus, like many such organisms, they tend to be rather languid in their movements and escape behaviors. They can become quite abundant on fruiting cacti, particularly Opuntia by August and Septetember. Similar species may also become pests on fruit trees in urban areas of the Sonoran Desert such as Phoenix and Tucson, Arizona. Like all true bugs Narnia feed by inserting a thin, tubular proboscis through the plant cuticle and into more nutritious tissues below. The preferred target for feeding is developing seeds that are rich in proteins. Through the straw-proboscis the bugs can take in only liquid food - if the point reached by the piercing proboscis is dry the bug will inject some digesting saliva first and then reimbibe the partly digested material. In so doing they damage or kill the developing seeds and may introduce fungi or other rot-causing pathogens. Damaged seeds may appear dark or shriveled and have lower germination success.